For today’s Nice Price or Crack Pipe we have a cozy camper that’s just a little rough around the edges. We’ll have to decide if its price might just worth roughing it. Let’s consider things that go together. There’s peas and carrots, peanut butter and jelly, and the old classic- death and taxes. Of course in America at present, that last combo seems reserved just for us poors. One combo that didn’t seem a match made in heaven was Mercedes and Mopar. It totally wasn’t for want of trying. Daimler AG tried to leverage their Mercedes knowhow in the running of Chrysler and its subsidiaries, but the marriage didn’t stick. It’s almost as if there was some unimaginably wide gulf between one of the world’s greatest auto marques and Chrysler. The fall out of the short corporate coupling included cars like yesterday’s 2005 Chrysler Crossfire SRT-6, which was mostly Mercedes under its retro-fashion skirts. Mitigating that was the American company’s lesser valued badge up on top. You weren’t having any of it. That Crossfire wasn’t perfect, and in the estimation of 68-percent of you, that meant it wasn’t worth its $12,999 asking. Rare for a reason, the Crossfire got caught in a Crack Pipe loss. Today we have another rare duck. This 1977 Chevy Blazer Chalet is one of only about 1,800 built over the course of the ’76 and ’77 model years. They were the product of the Chinook RV company of Union Gap, Washington, one of the nation’s oldest recreational vehicle builders at the time, and addressed America’s need for more fuel efficient homes away from home. That’s all well and good and all, but first, just what the hell is is a Blazer Chalet? The most important thing to know about this camper is that its name is pronounced shal-lay like in the potato chips, and not shal-let like in toilet. That’s wholly appropriate since, while this camper does offer a stove, fridge, banquette, and other comforts of home, it does not provide a place for you to drop a deuce. That name, Chalet, comes from the French and sounds very urbane as a result. The even more rare GMC Jimmy edition took a more southern approach for its moniker, using the Spanish “Casa Grande.” That’s pretty odd for something that doesn’t have a crapper. The camper portion of the truck is a fiberglass shell with an extendable “pop-top” roof. That slides into the Blazer’s bed like any pickup-based unit. The difference here is that the front of the camper portion is open and it slides into the gaping maw of the Blazer’s bed which is also open. That creates a pass-thru from cab to camper, expanding the usable space. This one comes with a 400 cubic inch gasoline V8 and a THM350 three-speed automatic. Connected to that is a two-speed NP203 transfer case that sends power to both front and rear axles. The two-tone truck on top of all that is dirty, rusty, and missing at least one headlight, giving it a zombie apocalypse vibe, just from the wrong side of the action. The rust seems limited to the edges of the doors, rockers, fenders and wheels, but hell, all those parts should be available for repairs. The hood looks to be bowed on one side in the pictures, but the truck otherwise looks straight. These are of course ladder frame and tough as nails so don’t let some aesthetic abnormalities scare you away. Nicely, the interior is reasonably clean. I mean, I don’t get the vibe that you’d need a hazmat suit and a bleach bomb before entering it. Sure, the vinyl seats need recovering, and the carpet is a little grungy, but it still looks like a solid base for an easy project as it all looks to be intact. There’s 54K on the clock and the truck’s title is clean. There’s no word in the ad on whether or not everything works the way it should, nor if the registration is current. Still, these things are pretty much dead simple so breathing life back into that drivetrain shouldn’t require a PhD or a shaman to complete. 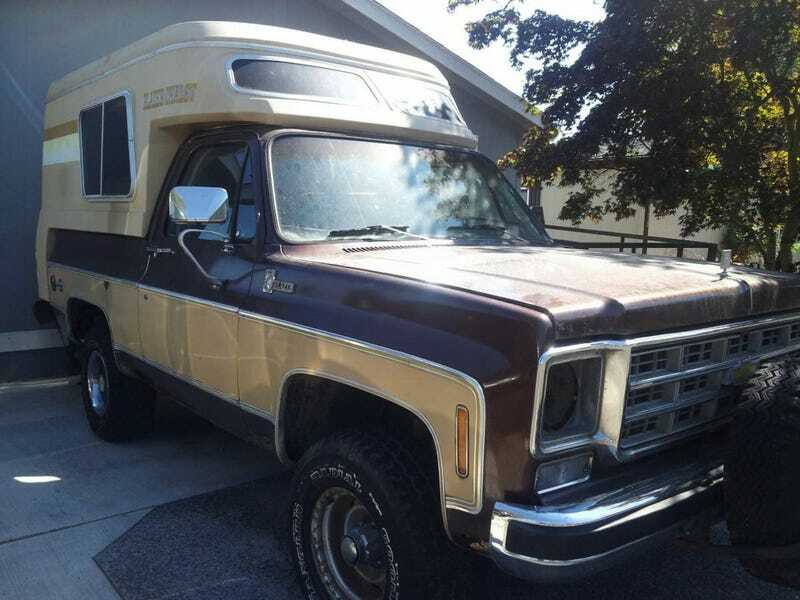 The asking price for this rare camper—Blazer and Chalet—is $2,995. Now, I don’t know about you, but three-large for a car you can live in fairly comfortably seems like a deal. Of course, it’s not my opinion that matters, it’s yours. What’s your take on this rustic Chalet and that $2,995 price? Does that take some of the rough off the edges? Or, does that just have you edging for the door? At $12,999, Could You Get Caught In This 2005 Chrysler Crossfire SRT-6?